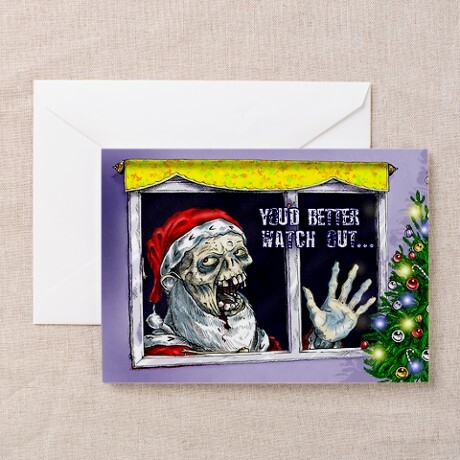 Have Yourself A Zombie Themed Christmas... Now! 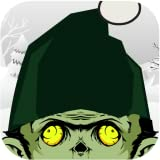 If you're wondering how you can possible combine jolly Christmas time with scary Zombies well there are plenty of Zombie Christmas items to get you started. 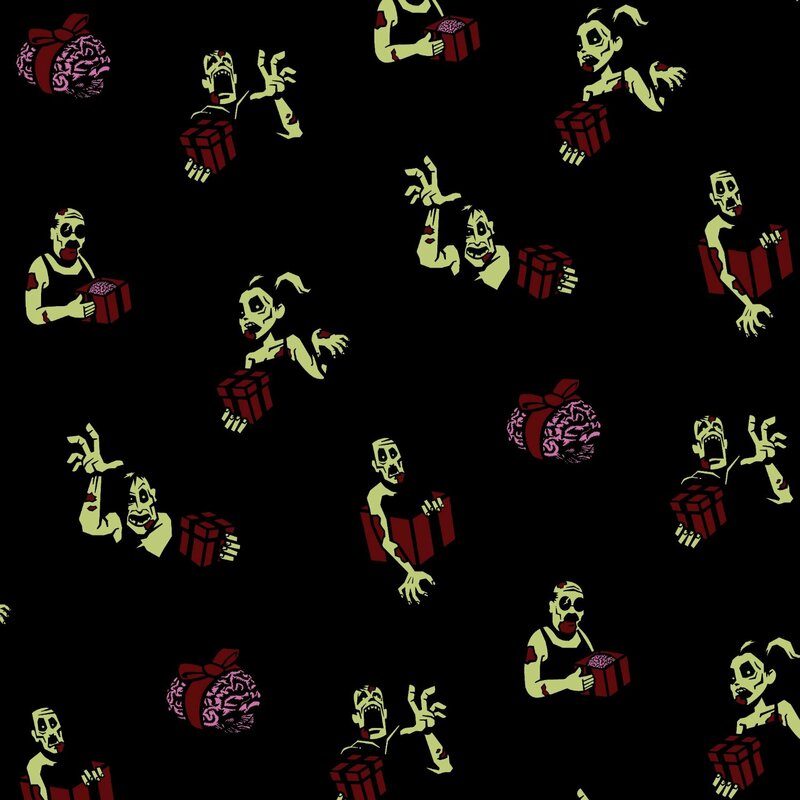 Whether some zombie themed Christmas decorations for home or a Zombie Christmas Book wrapped with Zombie Christmas Wrapping Paper for that zombie fanatic in your life. 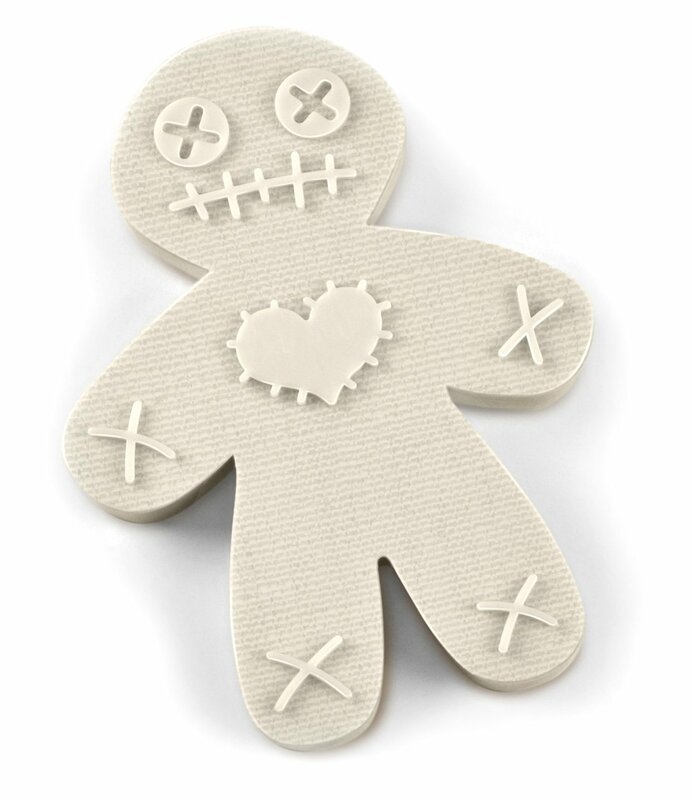 If you still can't find what you're looking for don't worry, we've compiled a list of the best zombie gifts available right now. The zombies have taken these gingerbread men and ripped their cookie limbs and bitten their heads into crumbs! The vicious zombie gingerbreads are here to cause a scare this Christmas! Have you tried a Crazy Dog T-shirt yet? Just Wait until you slip on one of these super soft tees. You'll instantly fall in love! Not only are they printed on super soft cotton but the tees fit great too. Try one and you won't go anywhere else! With over 900 designs Crazy Dog is the online destination for your favorite tees. Many of our designs are available in mens, womens, and youth sizes and come in a variety of different colors. Check our store to see them all! Get creepy this holiday season in this hilarious zombie ugly sweater print red hoodie. Made with a soft cotton poly blend, this hoodie will keep you warm and cozy all winter long. Jingle some bells and empty some shells!What would you do to save Christmas in a Zombie Apocalypse?This short story is about three men who risk life and limb in order to bring happiness to surviving kids on Christmas Morning.5 out of 5 stars - An Uplifting Tale of Christmas Generosity, in a Time When Helping Others is a Real Challenge.5 out of 5 stars - I love zombies and I love Christmas ~ A winner!5 out of 5 stars - A Cute Little Holiday Horror Story.5 out of 5 stars - In a zombie world, there is a Christmas miracle.Bonus Short Story: A Zombie Christmas 2A boy lost. A family desperate. 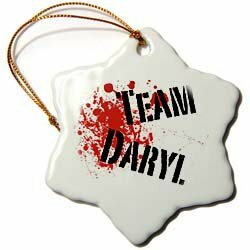 It's Christmas in a Zombie Apocalypse and Mike Beem is once again aiming for another Holiday miracle. His goal this year isn't toys for the kids in the neighborhood. His goal this time is trying to save one small life so another family doesn't have to suffer the way he suffered. Can Mike save Christmas once again? Even zombies need a chance to be on an ugly sweater! Show your love for the undead when you rock this funny shirt at this year's ugly sweater party! Have you tried a Crazy Dog T-shirt yet? Just Wait until you slip on one of these super soft tees. You'll instantly fall in love! Not only are they printed on super soft cotton but the tees fit great too. Try one and you won't go anywhere else! With over 900 designs Crazy Dog is the online destination for your favorite tees. Many of our designs are available in mens, womens, and youth sizes and come in a variety of different colors. Check our store to see them all! Get creepy this holiday season in this hilarious zombie ugly sweater print black hooded sweatshirt. Made with 100% cotton, this hoodie will keep you warm and cozy all winter long. Get creepy this holiday season in this hilarious zombie ugly sweater print black juniors t-shirt. Made with 100% cotton, this will keep you festive and cozy all winter long. Fresh brains roasting on an open fire . . . Outside the temperature's dropping. The snow is falling, blanketing the world in white. Sleigh bells are jingling. Soon it will be that most wondrous time of the year That time of flesh-devouring zombie horror Yes, Christmas is on its way--and all the little boys and ghouls are dreaming of stockings filled with candied eyes and bleeding body parts. You'd better watch out Santa Claws is coming to town--and he knows who's been naughty, who's been naughtier . . . and who'll taste best with a nice glass of Chianti In celebration of this merry macabre season, we present a peerless compendium of more than two dozen of the most soul-stirring, brain-boiling carols composed specifically for the decomposing. 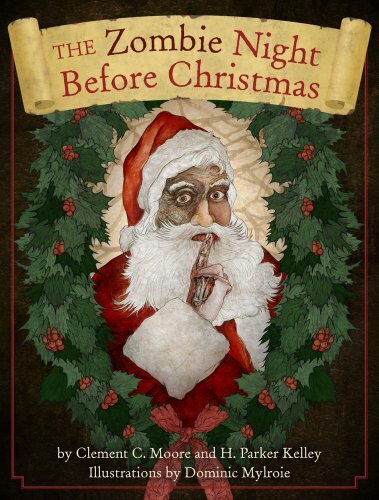 Holiday favorites such as "I Saw Mommy Chewing Santa Claus," "Deck the Halls with Parts of Wally," and "We Three Spleens" are guaranteed to lift the spirits of the lumbering, shuffling undead and their temporarily still breathing meals-to-be. So put down your gore-splattered baseball bats and raise your voices in song And sing loudly--to drown out all the screaming. The first part of seventh grade was rough on Jed, but things are looking up now that Christmas is almost here. As with past Christmases, Jed asks for the one thing he's always wanted-a dog-and again, his parents tell him they're not ready. But fate has a different plan when Jed sees a dog get run over by a car. Then, it happens. Jed suddenly has a pet, Tread, a zombie dog bearing his namesake-a tire tread down his back. Jed may have gained a dog, but he loses his best friend Luke, who fears the way Jed created his undead pet. When Jed returns to school, he finds a mysterious group called the No Zombies Now Network spreading rumors of the dangers the undead pose to normal people. Forced to disprove Hollywood stereotypes, Jed has his work cut out for him as stories of a zombie dog begin to circulate. Jed could be expelled if he can't expose the NZN Network as a fraud. Jed needs help from his kind of girlfriend Anna, especially after he discovers Luke has joined the shadowy group. Once again navigating the treacherous waters of middle school, Jed does his best to stay in one piece. Only this time he'll need even more duct tape and staples than usual. Get creepy this holiday season in this hilarious zombie ugly sweater print red sweatshirt. Made with a soft cotton poly blend, this sweatshirt will keep you warm and cozy all winter long. National Bestselling Authors of Broken Hearted Ghoul and Dae?s Christmas PastWhen Nashville cop Skye Mertz and her husband, Jacob, are killed in a wreck, Skye is given the opportunity to come back for twenty years to raise her five-year-old daughter, Kate. With her ghostly mother-in-law?s help, Skye hopes to be there until Kate is old enough to take care of herself. But three years into her twenty-year service to Abraham Lincoln Jones, the man who gave her the extra time, Skye is beginning to think life might have been easier before she died. Abe asks her to investigate the murder of his sorcerer, Harold the Great, a man who was a victim of too many snakes. And the Life Extended People ( LEPs? a nice term for zombies) who work for Abe have begun turning into ghosts and disappearing. Only Lucas, the possibly evil, amnesiac sorcerer who lives with Skye and her family, can save her from being the next victim of the deadly curse. To make matters more complicated, Skye has found a lead in solving the riddle of her husband?s death. She has never believed Jacob died as a result of the crash, but hasn?t been able to prove it. Many other people have lost their lives in the same lonely stretch of highway that he did three years before. Skye goes against Abe?s express wishes to discover the truth with a crazy man bent on vengeance. Life was simpler when she could just take out a gun and shoot someone. This original Old Glory design is printed using cutting-edge direct-to-garment technology on a high-quality red 100% Cotton crew neck t-shirt. Designed in-house and printed to order, this is a one-of-a-kind tee for people with style to match. Zombies here and zombies there. zombies zombies everywhere! They have even made their way into Christmastime on this awesome ugly sweater! Have you tried a Crazy Dog T-shirt yet? Just Wait until you slip on one of these super soft tees. You'll instantly fall in love! Not only are they printed on super soft cotton but the tees fit great too. Try one and you won't go anywhere else! With over 900 designs Crazy Dog is the online destination for your favorite tees. Many of our designs are available in mens, womens, and youth sizes and come in a variety of different colors. Check our store to see them all!